Short-handed Spurs come back to earth after hot start. Remember not too long ago when the Spurs started the season 4-0 for the second year in a row, Dejounte Murray was red hot and looking like the he could be an All-Star as soon as next year, and the Spurs were hardly missing Kawhi Leonard on either end of the court? Welcome back to the real world. It turns out MVP’s, point guards with veteran experience and shooting range, and even back-up centers come in handy every now and then. Already down Leonard and Tony Parker, the Spurs lost energetic big man Joffrey Lauvergne along the way to a sprained ankle. It hardly seemed a concern as the Spurs pulled out wins against expected Eastern playoff teams Toronto and Miami (who admittedly were also missing key big men), but then the going got tough. The Spurs looked sluggish (to put it kindly) on the road against Orlando and couldn’t close out in Indiana despite building a nine-point lead midway through the fourth quarter. Murray has come back to earth, outside of Rudy Gay the bench has hardly been the potent force it should be (wherefore art thou, Patty Mills? ), and LaMarcus Aldridge and Danny Green have been the only consistent bright spots on offense. However, it’s way too early to panic. Opportunity awaits with big games in Boston tonight and at home on Thursday against the defending champions (who have looked extremely mortal to start the season), which kicks off six straight games at the AT&T Center and could possibly signal the return of Leonard. Parker is also participating in the Austin Spurs’ training camp, signalling a return sooner than later. With a little time and improved health, the Spurs will soon be back to the contending team they’re supposed to be. Though LaMarcus Aldridge is registering career-high marks in both effective field goal percentage and true shooting percentage, the Spurs’ Kawhi Leonard-less offense has not been good, save for Wednesday’s win in Miami and a couple of quarters against Minnesota in the opener. They were held under 90 points per 100 possessions in weekend losses in Orlando and Indiana, with Spurs not named Aldridge or Gasol shooting 28 percent. They’ve assisted on just 54 percent of their buckets, their lowest rate under Gregg Popovich. After tonight’s game at Boston, the Spurs won’t leave the Central Time Zone again until after Thanksgiving. 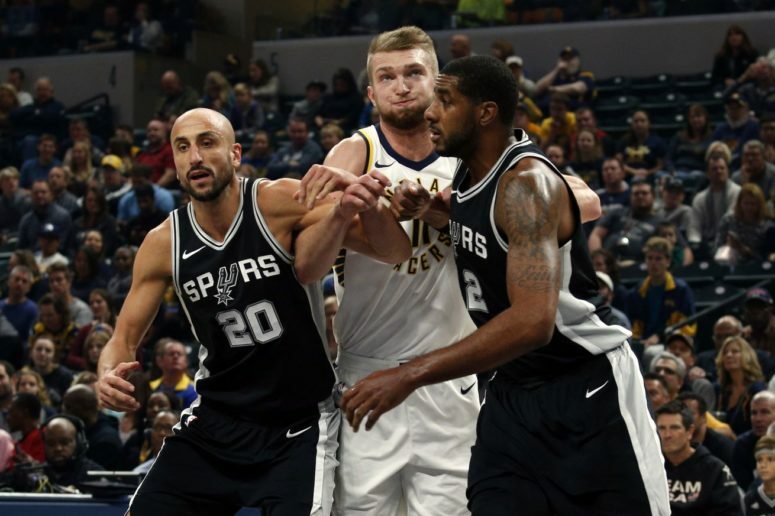 The Spurs finally took their first L of the season on Friday night at Orlando, then followed it up by blowing a late lead to the Pacers on Sunday. Though he hasn’t shot the ball well, Dejounte Murray has proven to be a quick study, and whatever LaMarcus Aldridge and Gregg Popovich schmoozed about in Pop’s office should be preserved for posterity. After a date at Boston, the Spurs settle in at home for a couple of weeks — a chance to bank a few more wins before Kawhi Leonard returns. Without Kawhi Leonard and Tony Parker, this is a somewhat vulnerable team. Get well soon, Kawhi. The Spurs bench looks really bad aside from Rudy Gay. When Kawhi Leonard and Tony Parker get back that should add a lot of depth to this group. San Antonio started off strong but they’ve had two awful losses to the Magic and Pacers. On the plus side, LaMarcus Aldridge has been incredible early on.